This is a flowering shrub/tree whose flowers are creamy-yellow with pink tinges; they turn into a pink fruit (?) like a large raspberry; I don't know what the plant is, or if the fruit is edible ! Thanks! Can you eat the fruit...safely that is !! 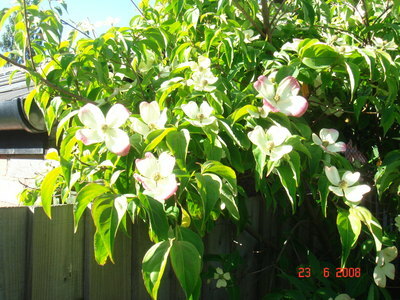 Looked again at my cornus, & the flower shape is different - the petals come to a point - but maybe it's a different type? Don't know, sorry! Check out Cornus nuttallii...Mountain Dogwood.